The bus from the airport eased to a stop terminating alongside the massive central train station as a constant morning drizzle fell from above. 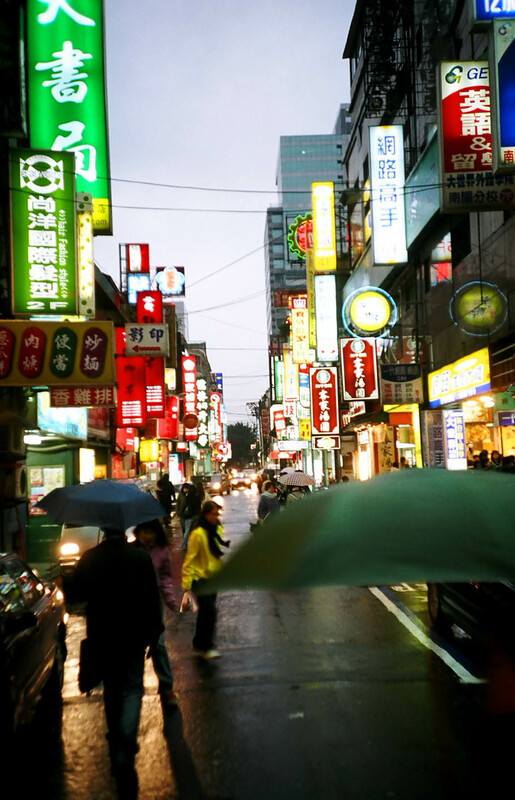 Across the street bright neon signs illuminated the morning sky giving raindrops a transient sparkle as they dropped to the ground. Near the train station huge industrial exhaust vents billowed clouds of wispy steam into the gray sky. Zhongshan Road stood in front of the station, a large avenue flanked by large department stores, imposing buildings, and innumerable pedestrians ambling on either side. The masses on this particular spring day hid from the rain underneath a vast sea of colorful umbrellas like an endless field of variegated wildflowers. I ducked out of the rain into the train station and perused my lonely planet and decided to make my way to a hostel that was listed as being near the train station on “Zhongshan Road”. Actually finding Zhongshan Road was a somewhat comical experience as the Romanized translation of Chinese name (the so called “pinyin”) was translated a thousand ways it seemed. It was with no small amount of confusion I finally figured out that “Zhongshan” was variously described as “Songchan Road” on another map I picked up , “Chongshen” Road on the actual street sign, and “Zhongshan” in the lonely planet map. This theme of protean yet ever innovative spellings and translations would occur again and again in my stay in Taiwan, apparently it is somewhat of a rarity that the spellings of streets actually correlate with the maps. Apart from the mild confusion with signs getting around Taipei is actually quite easy, The subways are efficient and speedy. They zip back and forth and are clean almost bordering on sterile, indeed it is quite common to see passengers wearing surgical masks of various cloth designs and styles to eschew pollution and germs. 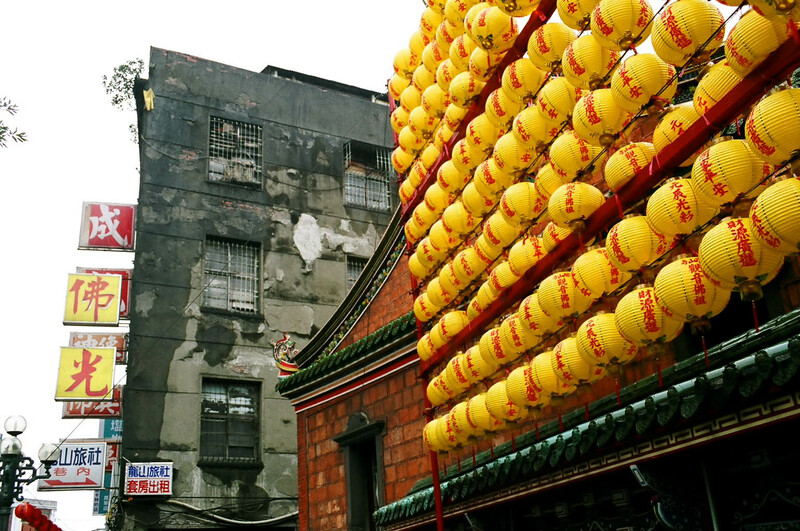 I was chopping down on some rice concoction on the subway I picked up from a corner store when a fellow passenger pointed to the sign on the subway window apparently stating in Chinese that the fine for eating on the subway was $250, puzzled I shrugged my shoulders as I quickly finished eating my snack. 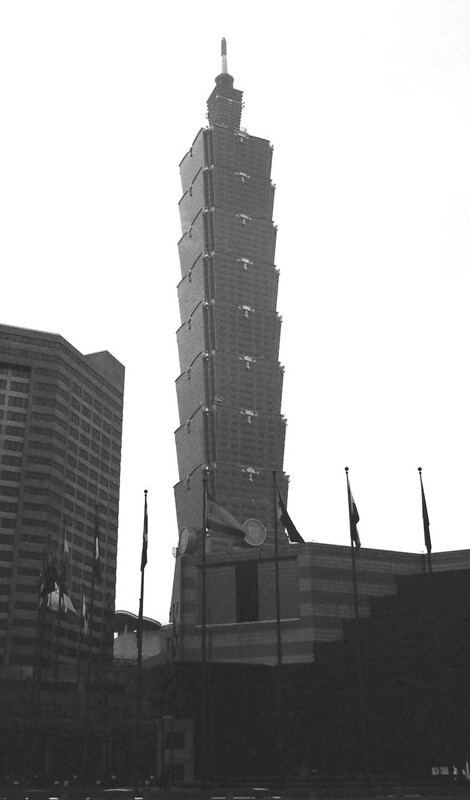 Taipei is a busy city with no shortage of things to see and do. 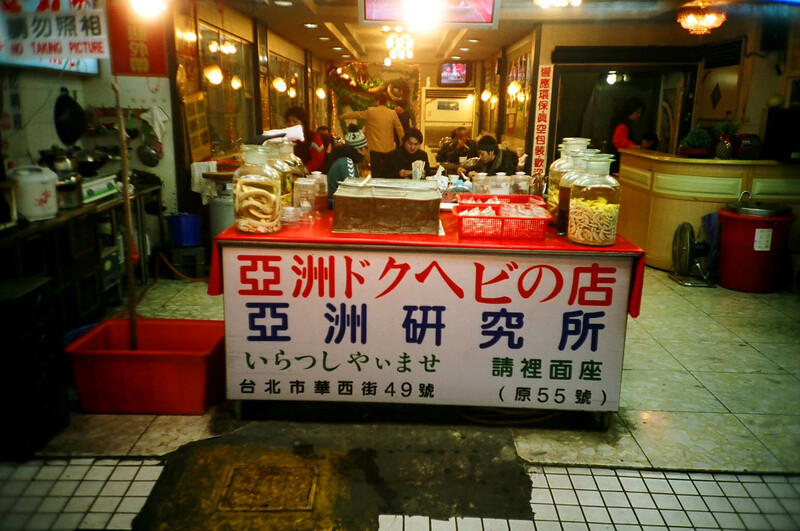 There are all the nighttime food vendors hawking any manner of delectable foods , arcades, markets, and interesting temples like Longshan temple where Buddhists chant and pray in a haze of incense and lanterns. Perhaps the most interesting recent edition to the city is in Songshan, the Taipai 101 building, the tallest building in the world (at least for the moment). The building tears 101 stories into the sky and was designed to resemble a stalk of bamboo tied together with strings of rope around its nodes, I’m not sure that I came away thinking I was looking at a really tall bamboo stalk, but the architecture is impressive, as successive sections of the edifice sprout from the wider portions below. A sprawling shopping and entertainment complex flanks its base where masses of people cruise the sidewalks. Crosswalks are quite interesting in Taipei, after waiting and waiting and waiting (and waiting) a funny lanky diminutive green animated character starts to walk as pedestrians follow his lead and the pavement is momentarily swallowed by a sea of people scurrying across the street. 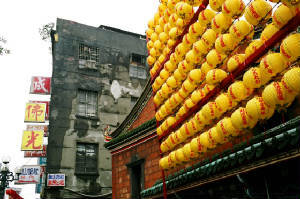 The buildings near the 101 building were adorned with giant dragon lanterns clinging to the sides of buildings and other various lantern designs on the sidewalks for the yearly lantern fest. These were no small lanterns indeed many were the size of a car if not much larger and at night illuminated they illuminated the foggy streets. Nearby imposing memorials to Chiang Kai-Shek and Sun Yat Sen sit near green parks where a small pond and surrounding gardens provide somewhat of a respite from the surrounding concrete jungle. Taipei also boasts what is described as the largest collection of Chinese art in the world (including mainland China). The collection is comprised of more than 650,000 pieces of Chinese art formerly housed in the Forbidden City Palace in Beijing. How the collection made its way to Taiwan is somewhat remarkable in that in all the shuffling supposedly not a single piece was lost or broken. When the Japanese invaded Manchuria in 1931 most of the artwork was hastily relocated from the Forbidden City and stashed away in Nanjing, Chongqing, and Emei for safekeeping from the marauding Japanese forces. After the Japanese were defeated in WWII the Chinese civil war heated up again eventually culminating in Mao and the Communist’s victory. Chiang Kai-Shek and the Kuomintang fled to Taiwan and loaded the art into boats and shipped it across the straight with them as they fled, vowing to eventually return and retake china. The triumphant return never materialized so Taiwan finally decided to put on permanent display in 1961 as it seemed they would never reconquer the mainland. The National Palace Museum is now filled with thousands of priceless calligraphy works, pottery, Buddha statue, works of jade and other artifact from ancient Chinese dynasties. For those seeking moments of Zen Danshui sits serenely at the end of one of the subway lines. The Danshui river courses along a fishmans wharf and a modest promenade. 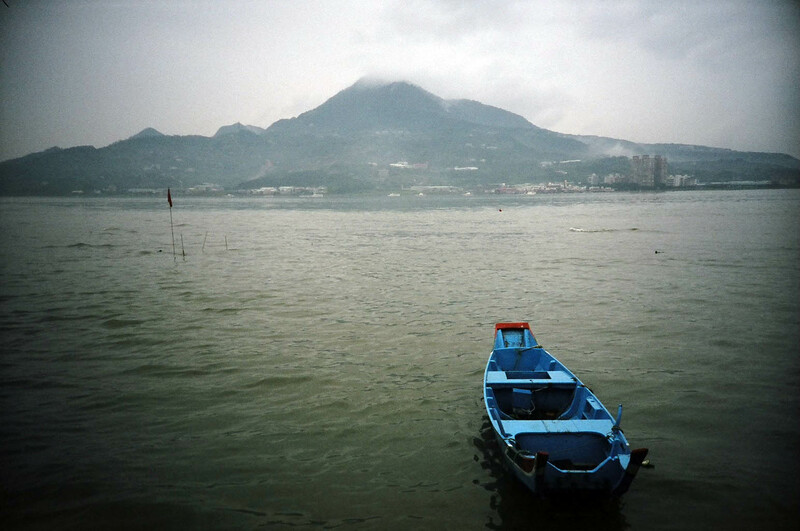 Across the river’s choppy waters somewhat buried in the fog is Guanyinshan Mountain. 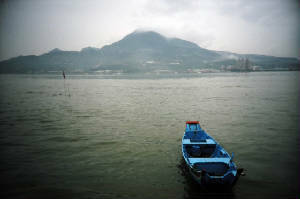 The river courses along scenic patches of mangrove trees and small boats rock in the waves of the river. Along the Danshui river sits the city of Danshui, a pleasant town with narrow streets packed with handicraft shops and foods stalls.